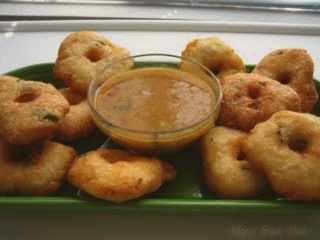 Vadai can vary in shape and size, but are usually either doughnut- or disc-shaped and are about between 5 and 8 cm across. Vadai are made from dal, lentil, gram flour or potato. Soak the dal in cold water for 4 to 6 hours. Drain off the water. Grind the dal to a fine paste, adding enough water to facilitate grinding. The paste should be stiff. Mix in the rice flour. Except for the frying oil, add remaining ingredients to the paste. Mix well. Heat the oil in a skillet. These vadai should be shaped like a doughnut. Moisten both hands with water. Place 1 tbsp. of butter in the left hand toward the finger tips. Flatten and shape into a centre and slide the vadai into the hot oil. Sometimes it seems easier to transfer it to the moistened right hand before sliding it into the oil. Fry 3 to 4 vadais at a time. Turn over vadai once while frying. Vadais are cooked to golden brown prepared in advance. Drain. Serve vadai hot. Reheat vadai by placing in a warming oven.